For all of their power and versatility, smartphones--even the best of them--are cursed with abysmal battery life. Unless you use your phone very sparingly (and who does that? ), you're lucky to make it home at the end of the day with enough juice left in the battery for one more call. But with the right apps and a little insight, you can double your smartphone's battery life--and work (and play) longer than ever before. The author's HTC Thunderbolt is lucky to survive an entire business day on one charge. But with the tricks in this article, he manages to get home at night with a little juice left in the battery. Most smartphone batteries today are rated at around 5 watt-hours, meaning that they can deliver a constant charge of 1 watt to the device over a period of 5 hours. If your phone actually uses 1 watt per hour, and you pull it off the charger at 7:00 a.m., you can expect it to be dead by lunchtime. So the key to increasing your phone's battery life is to reduce the amount of power the handset uses per hour. One obvious way to reduce your phone's energy draw is to use it less (yeah, right). A more practical approach is to manage the phone's power consumption by turning off unneeded features and turning down adjustable features. Turning off your phone's radios when you're not using them, reducing the screen's brightness, and killing apps that run in the background are among the tricks that can help your phone's battery last longer. They and other tricks and apps will help extend your phone's overall workday by reducing its moment-to-moment energy requirements. You love your smartphone's large, colorful display, but it's the battery's mortal enemy. More than any other component of your phone, the display consumes battery life at a devastating pace. Most phones include an auto-brightness feature that automatically adjusts the screen's brightness to suit ambient lighting levels and system activity. This mode uses less power than constantly running your screen at full brightness would, of course, but you'll get even better results by turning your screen's brightness down to the lowest setting that you can tolerate and leaving it there. Even if you do nothing else suggested in this guide, following this one tip will extend the life of your battery dramatically. Under your phone's display settings menu, you should find an option labeled 'Screen Timeout' or something similar. This setting controls how long your phone's screen stays lit after receiving input, such as a tap. Every second counts here, so set your timeout to the shortest available time. On most Android phones, the minimum is 15 seconds. If your screen timeout is currently set to 2 minutes, consider reducing that figure to 30 seconds or less. Disable Bluetooth when you're not using it, and your phone's battery will last longer. No matter now much you love using Bluetooth in the car or with your hands-free headset, the extra radio is constantly listening for signals from the outside world. When you aren't in your car, or when you aren't expecting a call that you'll want to take via a headset, turn off the Bluetooth radio. (Besides, walking around with a Bluetooth headset in your ear when you're not actually on a call doesn't do anything positive for your street cred anyway.) By turning off Bluetooth when you're not using it, you can add an hour or more to your phone's battery life. As with Bluetooth, your phone's Wi-Fi radio is a serious battery drainer. While you almost certainly should prefer the improved speed of your home or office Wi-Fi connection to your mobile carrier's wireless broadband for data services, there's no point in leaving the Wi-Fi radio on when you're out and about. Toggle it off when you go out the door, and turn it back on only when you plan to use data services within range of your Wi-Fi network. Android users can add the Wi-Fi toggle widget to their home screen to make this a one-tap process. Multitasking--the ability to run more than one app at a time--is a powerful smartphone feature. It also burns a lot of energy, because every app you run uses a share of your phone's processor cycles. By killing apps that you aren't actually using, you can drastically reduce your CPU's workload and cut down on its power consumption. For Android phones--which are notorious battery hogs due to their wide-open multitasking capabilities--we like an app called Advanced Task Killer, which has an auto-kill feature that polices your apps throughout the day. In iOS, double-tap the Home button until the multitasking tray appears, hold an icon until an X appears, and tap the X to close the app. Prefer to have your phone alert you to incoming calls by vibrating rather than playing a ringtone? We understand the inclination; unfortunately, vibrating uses much more power than playing a ringtone does. After all, a ringtone only has to make a tiny membrane in your phone's speaker vibrate enough to produce sound. In contrast, the vibration motor swings a small weight around to make your whole phone shake--and that process takes a lot more juice. If you don't want to be disturbed audibly, consider turning off all notifications and leave the phone in view so you can see when a new call is coming in. This approach is as courteous to your battery as it is to your friends and neighbors. It seems as though almost every app in the app store now polls the Internet in search of updates, news, messages, and other information. When it finds something, the app may chime, light up your screen and display a message, make your LED blink, or do all of the above. And all of these things consume energy. Admittedly you likely don't want to turn off notifications about new text messages or missed calls, but you don't need to be instantly alerted that radboy84 has just bested your score at Booty Blast. Turning off superfluous notifications will help your battery last a little longer, and it will eliminate pointless distractions throughout your day. 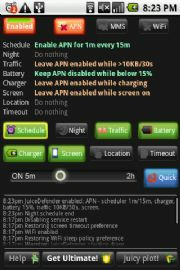 JuiceDefender automatically adjusts your phone's settings throughout the day to keep battery consumption in check. Newer Android phones include a Power Saver mode that helps manage the phone's various power-sapping features for you. Power Saver mode automatically prevents your apps from updating in the background, dims your screen, reduces the screen timeout setting, disables on-screen animations, and turns off vibration. By default, this mode usually turns on when your battery level drops to 20 percent, but you can set it to kick in at 30 percent instead. And the sooner the phone switches to Power Saver mode, the longer its battery will last. By manually adjusting all of your phone's settings over the course of a day, you may be able to squeeze a few extra usable hours out of your battery. But if the effort sounds too cumbersome to you, consider downloading an app that manages your battery for you. On Android phones, we've seen great results from JuiceDefender, which automatically toggles your radios on and off and manages your phone's CPU usage to optimize your battery life moment-to-moment. The single most common complaint you'll hear about any smartphone is how lousy the battery life is.